Trail Head / Parking Directions – Turn onto Green Lake Rd., 0.5 miles bear left at fork to parking. 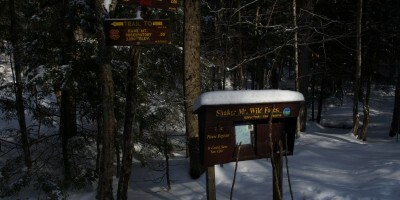 Trail head is several hundred feet past the parking area to the right. The trail is fairly flat, passing by Stewart Lake (1.4miles) and then on to Indian Lake. There are tent campsites on both lakes. This trail is also used for cross country skiing in the winter.